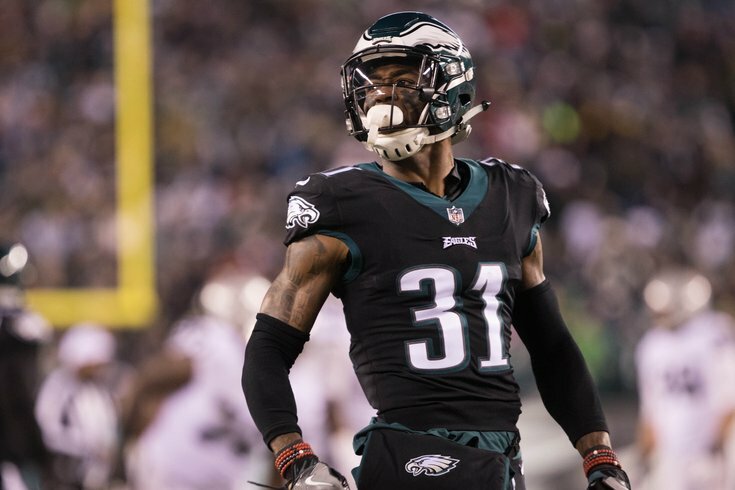 Philadelphia Eagles cornerback Jalen Mills reacts to a defensive stop against the Oakland Raiders. In case you haven't heard, the Philadelphia Eagles are underdogs against the Atlanta Falcons despite being the home team and the No. 1 seed in the NFC, marking the first time a top-seed has ever been a home dog against a No. 6 seed in the NFL playoffs. And while professional athletes will tell you that they don't pay any attention to the odds and predictions, that's not entirely true. It's everywhere, and nearly impossible to ignore. "We understand that [we're underdogs] but it's not going to affect us. We're going to go out there with this edge that we have. We know what we can do. We believe in each other. And we're going to play for each other." Unfortunately, Foles – or, rather, the absence of second-year quarterback Carson Wentz – is the biggest reason the Falcons are a road favorite on Saturday. But it goes well beyond just the occasional text message or notification on their phones, and recently it even became too much for right tackle Lane Johnson, who stopped speaking to the media for a few days last month as a result. Now, he's viewing it a bit differently. "What bothered me is that we were 12-2 and people were treating us like we were the [Cleveland Browns]," Johnson clarified following practice on Tuesday. "It happens, but although we don't like it, I think it's a good motivator. I'd rather have people not write good things; I think it's the best motivator there is and then you can go and change [that perception]. Ultimately, it's all up to us. "A lot of what you all [the media] do motivates us. It motivates me; it motivates a lot of guys in here. It's good for us. I'd rather have guys doubting us than patting us on the back anyway heading into this game." Since the Eagles have received more than a few pats on the back this season, it's easy to forget that heading into the second year of the Doug Pederson-Carson Wentz Era many people believed the Eagles would either fall short of the playoffs or sneak in as a wild card. Almost no one was predicting a season like the one they just had. This team had plenty of doubters long before Wentz tore his ACL. And the Eagles haven't forgotten that. "We've been disrespected all year," said cornerback Jalen Mills. "Regardless of if 11 was back there in the backfield or Nick was back there, we've been disrespected all year. Maybe earlier in the season we were kind of pissed about it. But now, it's kind of in our DNA now. "We know how people view us, how people see us. But at the end of the day, we always find a way to win." The underdog mentality is clearly being embraced in the lead-up to Saturday's date with the Falcons. But will it really make a difference once the ball is kicked off and the game is underway? "Unless we start the game down, no. The game's going to start 0-0," defensive coordinator Jim Schwartz said Monday. "I mean, that stuff makes for good talk and TV, and a lot of people have a lot of programming to fill, but all year, I have no idea if we've been favorites or underdogs the whole year. It's not going to change now. "It really doesn't change the game. The game is going to be about preparing well. The game is going to be about executing on Saturday... and the teams that do that the best are going to win – not the team that got picked by the most number of analysts or experts or what the simulation games say or any of that stuff. That has zero bearing on the game for us." It appears that the players, however, aren't as quick to dismiss the underdog rallying cry. Not everyone inside the locker room is bothered by the outside noise. But even those who aren't, like wideout Torrey Smith, hear it and, more importantly, understand why it exists. "Honestly, and I'm not even lying to you, it doesn't bother me that much because before we started the season, no one thought we were going to be good," Smith said. "So when you look at it like that – that's kind of you all's job to do, and I respect that; and that's the fans' job to do, and I respect that as well. "But, for us, our goal and our job is the same and we kind of just kept chipping at it and kept working and working and ended up with 13 wins. Obviously, that doesn't mean anything if we don't win next week and continue to win. I say it all the time, there's one winner and 31 losers, so I'm trying to be the last team standing."